Some things never change. It won’t be too long until we are celebrating the 50th Anniversary of Mario and his penchant for bouncing off the heads of unsuspecting Goombas out for their morning stroll. When those celebrations roll around in 2035, odds are good that the Mario games of that time will still be familiar to fans of the original, just as New Super Mario Bros. U for the Wii U will be instantly recognizable to fans of the original Super Mario Bros. on the NES. 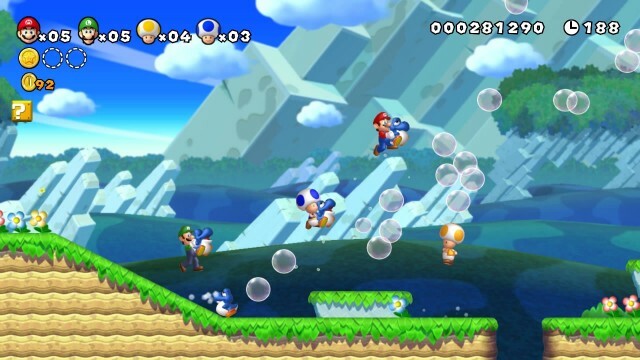 New Super Mario Bros U. doesn’t challenge any conventions, nor does it change the traditional dynamics of the series. In fact, with very few exceptions, not much has changed between this game and the previous iteration on the Wii. You still send the famous plumber and his posse through side-scrolling levels, massacre several creatures that have the unfortunate task of walking in a straight line that offends Mario, and race the clock to reach a final flag that helps you progress to once again rescue the kidnap-friendly Princess Peach from the clutches of the psychotically obsessive Bowser. It’s the same game you have seen for decades, but with a few new tweaks and HD graphics. So why is it still so much fun? Shigeru Miyamoto’s design of the original Super Mario Bros. was a moment of brilliance. It defined a generation of gamers, and remains as valid today as it was in 1985. The Mario franchise has seen several twists on that design since, and Mario himself has been represented in countless forms, but the classics never die. That original side-scrolling Mario style has seen a comeback under the “New Super Mario Bros.” banner. Despite the new system, this title is very much a throwback to the games of the past. As with the previous New Super Mario Bros. Wii, you have the option of taking up to four players (using the standard Nintendo Wii Remote) at once through several platforming worlds filled with power-ups and warp pipes, collecting coins and crushing Bowser’s doomed children along the way. Coordination is the key, as you will often come across sections that require precise timing, a feat complicated by the inclusion of four players. The levels are crisp and lush in the new HD graphics, and the art design and creativity stand out. Of course, a Mario game wouldn’t be complete without interesting and original level design, which appears here in spades. Nothing should feel too out of place, though, since you have seen most of it before and none of the new additions significantly alter the experience. With five players all working on the same screen, things can quickly grow complicated and confused, but that doesn’t mean it isn’t fun. If you have people competing with each other, then it will be a relatively short gaming session. If you have five people working as one, it becomes a unique cooperative experience. The only really new inclusion is the Wii U’s GamePad, which gives a fifth player something to do during multiplayer sessions, as well as giving single players a new method of playing. As a single player, the GamePad presents one of the more compelling features of the Wii U: the ability to play a full game at HD resolution on a portable screen. What you see on the GamePad mirrors what is on the TV, which allows you to use the TV for other things. If you want to pass off the TV to someone else in the house so they can watch something else, simply change the input and play from the GamePad. The experience is the same. This is something that developers will need to code into their games – it isn’t native to every Wii U title – but it represents one of the best options of the Wii U and works perfectly here. 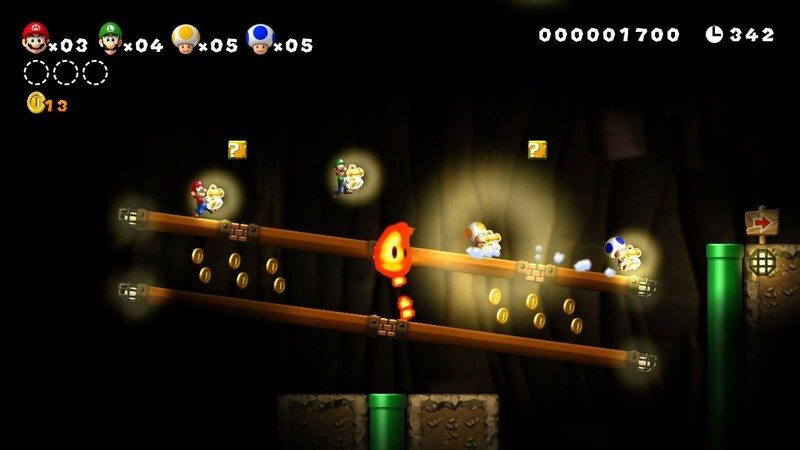 During multiplayer, the fifth player can use the GamePad to help the other four playing on the TV – if they want. Using the touchscreen, the GamePad players can create platforms for the other characters to use in order to reach higher areas, or to save them from a fatal fall. Or the GamePad wielder can go the other route and be a vengeful god, putting blocks in their way, stalling players mid-jump, or possibly favoring one person at the cost of the others. It is an interesting idea, but a shallow one. Once the novelty wears off, it’s hard not to feel like the fifth player is getting shafted while the others are enjoying the platforming. A bit more inclusion would have been nice, but the transferable single-player experience makes up for it. Along with the standard campaign, there are a series of additional game modes to try out, including: Boost Rush Mode, Coin Rush Mode, and Challenge Mode. The Boost Mode is a speed run with an assist from the level itself. Using sections from the story, you replay them with a timer and an increasing scroller speed. The further you go, the faster the game scrolls. The Coin Rush Mode is a competitive mode for two to four players all trying to collect the most coins as quickly as possible, with a fifth helping out (or not). You can also use the GamePad to customize the level by placing coins wherever you want. The Challenge Mode is the most impressive of the additional mode. It offers several takes on conventional Mario gameplay, broken up into categories based on the style. One has you jumping on the heads of Goombas for as long as possible without touching the ground, while another has you practice your gliding. There are speed runs and acrobatic levels that require you to carry a baby Yoshi through. Together, they give a nice variety. Completing these mini-games doesn’t take long, but earning the top medals will take time. For those in love with the Mario gameplay – and there are many of you – this mode is solid. Overall, New Super Mario Bros. U is a good start, but it would have been nice to see something totally new for the new system, rather than a sequel that was itself an homage to previous games. It is still a solid Mario game, but for the Wii U it suffers a bit for more-of-the-same-itis. New Super Mario Bros. U challenges no conventions of the Mario universe, and doesn’t offer much we haven’t seen, beyond the cursory inclusion of the GamePad and the HD graphics. But there is a reason these games continue to march on. The level design is as imaginative as ever, and the multiplayer aspect – while often hectic – is a lot of fun, and should be a huge hit for families looking for a way to bring everyone together and try out the new system. It’s good to have Mario make the jump to a new generation of console. His first offering is incredibly familiar and won’t push the franchise forward, but it is a solid offering, and a good sign of things to come.